The British Pound paused to consolidate gains after rising to the highest level in nearly two months against the Japanese Yen. 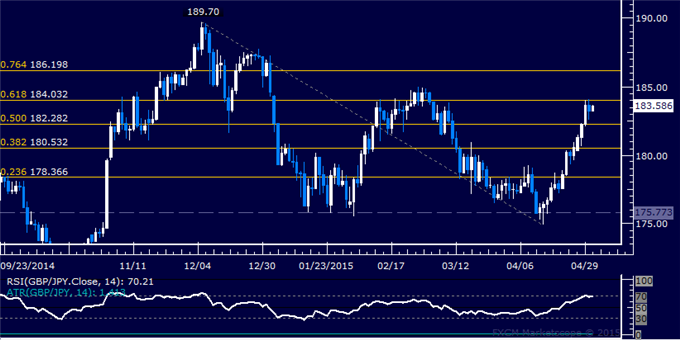 Near-term resistance is at 184.03, the 61.8% Fibonacci retracement, with a break above that on a daily closing basis exposing the 76.4% level at 186.20. Alternatively, a turn below the 50% Fib at 182.28 clears the way for a challenge of the 38.2% retracement at 180.53. Risk/reward considerations argue against entering long with prices in close proximity to resistance. On the other hand, the absence of a defined bearish reversal signal suggests taking up the short side is premature. We will remain flat for now, waiting for an actionable opportunity to present itself. 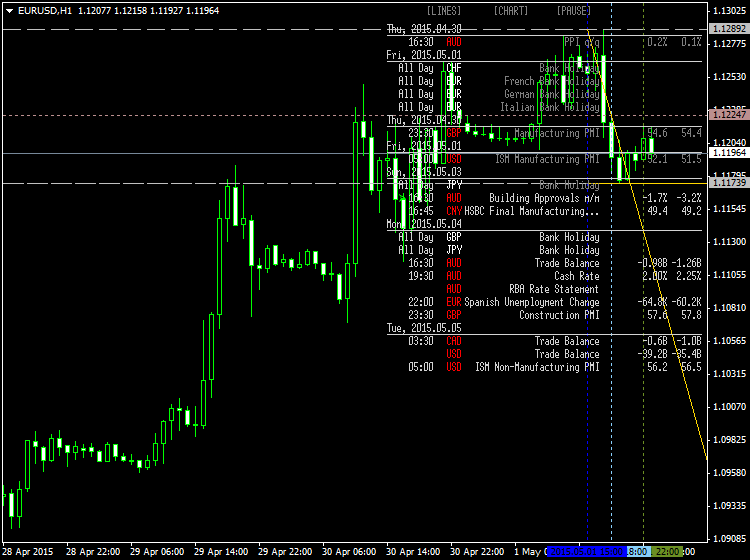 EURUSD double bottom may target mid-$1.1500s. USDJPY positioning favors further gains on USD recovery. The ECB's QE trade has consisted of three components in 2015: a weaker Euro; higher bond prices/lower bond yields; and higher equity markets. This week especially, we've seen that trend reverse, and quite quickly: the Euro has rallied; German yields, especially at the long-end, have shot higher; and equity markets across the Euro-Zone have slipped. There is thus a split in the US Dollar's prospects, depending upon where you look. In EURUSD, the potential for a move into the mid-$1.1500s seems possible given the potential double bottom nature of the recent consolidation breakout, boosted by the extreme Euro short positioning seen in the futures market. On the other hand, if the US Dollar is to continue its recovery after the shelling it took over the past two weeks, then USDJPY may offer the best opportunity, given that the market is the least short the Japanese Yen since Q4'12 - right before Abenomics began and the Yen's meltdown commenced. This past week, the USDollar posted its first drop on a monthly basis in 10 consecutive months. 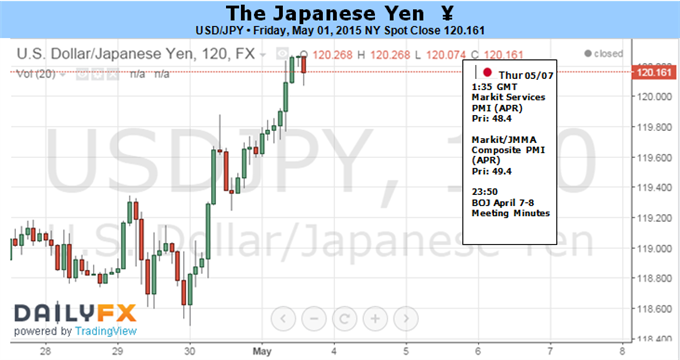 The Japanese Yen finished the week notably lower versus the US Dollar but stuck to its long-standing trading range. Headlines surrounding the U.K. election are likely produce increased volatility for GBP/USD, but the uncertainties clouding the fiscal outlook may only act as a near-term driver for the British Pound as the Bank of England (BoE) remains on course to normalize monetary policy. The Australian Dollar may rise if the RBA decides not to cut interest rates its May meeting. Seemingly compelling evidence suggests they may opt to do just that. Gold prices fell to a 6-week low with the precious metal off by more than 0.50% to trade at $1172 ahead of the New York close on Friday. 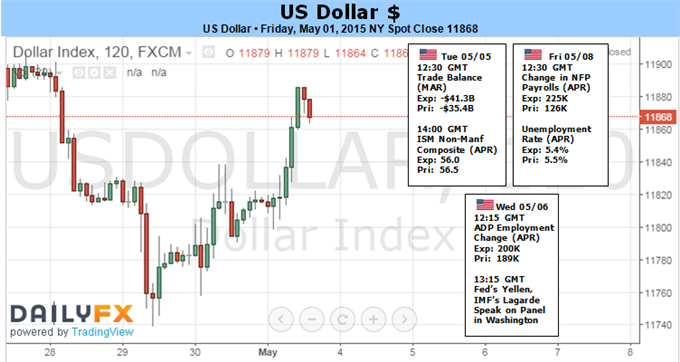 The US dollar experienced a very turbulent week, tumbling down and recovering, but not against the euro. Close elections in the UK, an important rate decision in Australia, employment data from New Zealand, Australia, Canada and the all- important US non-Farm Payrolls release are key events. These are the highlight events on Forex calendar for this week. Here is an outlook on the top events coming our way. The Federal Reserve downgraded its economic outlook amid soft growth data. The Fed admitted recent weakness in the first quarter relating it to temporary factors. Inflation will have to climb back to 2% and the job market needs to improve further before a rate hike is announced. However, the Fed believes the US economy will rebound in the second quarter. Meanwhile, jobless claims released last Thursday, surprised markets with a 34,000 fall in the number of claims nut not all data points impressed. The biggest winner was the euro, that broke critical resistance and seems unstoppable. Poor data weighs on the pound towards the elections and central banks weigh on the kiwi and the Aussie. Australian rate decision: Tuesday, 4:30. The Reserve Bank of Australia kept its cash rate at 2.25% for the second consecutive month in April, as the majority of policy makers decided against another rate cut. The last rate cut in February was designed to boost growth in non-mining sectors. RBA governor Glenn Stevens notes in his rate statement that further easing measures will be announced in the next few months. No change in rate is expected this time, but there is no 100% consensus. This means that a rate cut will hit the Aussie, and another “no cut” is set to boost it. US Trade Balance: Tuesday, 12:30. The U.S. trade deficit narrowed in February to the lowest level since 2009, reaching $35.4 billion. Economists expected deficit will rise to $41.3 billion. However, the strong dollar, weak global demand and lower crude oil prices probably impacted trade balance in February. Despite the low deficit, economic growth slowed considerably in the first quarter. Exports declined 1.6% to $186.2 billion, the smallest since October 2012, while imports from China fell 18.1%, pushing the politically sensitive U.S.-China trade deficit down 21.2 percent to $22.5 billion. Trade deficit is expected to grow to 39.7 billion in March. US ISM Non-Manufacturing PMI: Tuesday, 14:00. The U.S. non-manufacturing sector continued to expand at a slower pace in March, as service companies increased their export orders. Economists expected Non-Manufacturing PMI to reach 56.6. The majority of respondents’ were positive about business conditions and the overall economy. The ISM’s new orders index increased to 57.8 in March from 56.7 in February. The export index jumped to 59.0 from 53.0. The ISM business activity index declined to 57.5 from 59.4 in February and 61.5 in January. Non-manufacturing PMI is expected to reach 56.2 in April. NZ employment data: Tuesday, 22:45. New Zealand’s employment market expanded 1.2% in the fourth quarter of 2014, compared to 0.8% growth in the previous quarter. Economists expected a 0.8% rise in the number of new positions. Despite the bigger than expected job gain, the unemployment rate increased to 5.7% from 5.4% in the third quarter, posting the highest unemployment rate since Q1 2014. Analysts estimate an average of 5.2% in 2015. New Zealand’s employment is expected to grow by 0.7% in the first quarter, while the unemployment rate is forecasted to decline to 5.5%. US ADP Non-Farm Payrolls: Wednesday, 12:15. The U.S. private sector registered the smallest job gain in more than a year, adding 189,000 positions in March. The reading was below market forecast of 227,000 jobs and weaker than the 212,000 increase in posted the previous month. Harsh winter, a strong dollar and weaker global demand were partial causes for the disappointing jobs release. ADP private sector employment is expected to grow by 185,000 in April. Janet Yellen speaks: Wednesday, 13:15. Federal Reserve Chair Janet Yellen will speak in Washington DC. She may speak about the recent FOMC rate decision the state of the job market. Market volatility is expected. Australian employment data: Thursday, 2:30. Australia’s labor market expanded by 37,000 new jobs in March, pulling the unemployment rate down to 6.1%. The majority of jobs asses were full time positions. Economists expected a lower gain of 14900 positions and forecasted unemployment of 6.3%. Productivity has climbed increasing employers’ demand for workers. Improved job prospects expected to lift household incomes and boost the economy. Australian labor market is forecasted to expand by 3,100 jobs, while the unemployment rate is expected to reach 6.2%. US Unemployment Claims: Thursday, 12:30. The number of Americans filing new claims for unemployment fell last week to the lowest level since 2000, indicating the weakness in the labor market during March was only temporary. The number of initial claims plunged 34,000 a seasonally adjusted 262,000, beating forecasts for 290,000 new claims. The four-week moving average declined l 1,250 to 283,750. 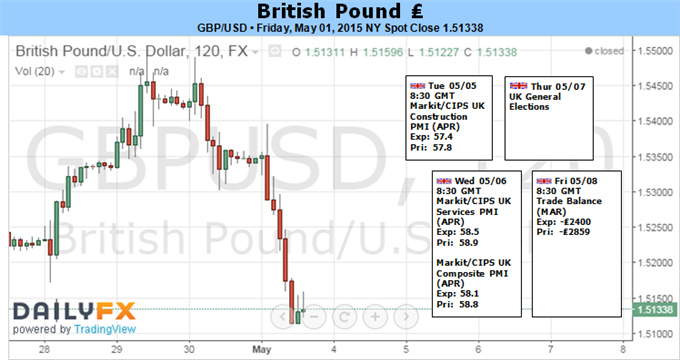 UK elections: Thursday, initial results expected late in the US session. After 5 years of a Conservative-LibDem coalition, incumbent David Cameron boasts an recovering economy while Labour leader Ed Miliband points to deteriorating standards of living. The markets would prefer a Conservative government, the current coalition or at least an outright majority for Labour. However, things look much more complicated, with both leading parties expected to fall short of a majority and a hung parliament also on the cards – an uncertain situation with negative ramifications for the pound. Polls are too close to call, making it an interesting event indeed. Canadian employment data: Friday, 12:30. The Canadian economy unexpectedly added 28,700 jobs in March, beating forecasts of jobs contraction. The majority of jobs were part-time positions, but employers also cut 28,200 full-time jobs. The main gain was detected in the service sector. RBA Governor Stephen Poloz stated that first quarter growth will be badly affected by the recent oil price collapse. The labor participation rate edged up to 65.9% from 65.7%. The unemployment rate remained at 6.8% while expected to tick up to 6.9%. US Non-Farm Payrolls: Friday, 12:30. US non-farm payrolls disappointed in March showing job growth of 126,000 positions, far below the 246,000 gain expected by analysts and following 295,000 job addition in February. Meanwhile the unemployment rate remained stable at 5.5% in line with market forecast. The employment-population ratio remained at 59.3%, while the participation rate edged down to 62.7% in March from 62.8% in the prior month. US private sector is expected to gain 231,000 jobs, lowering the unemployment rate to 5.4%. Euro Resilience Pushes Retail Positions to Extremes- 1.1300 Still in Focus. 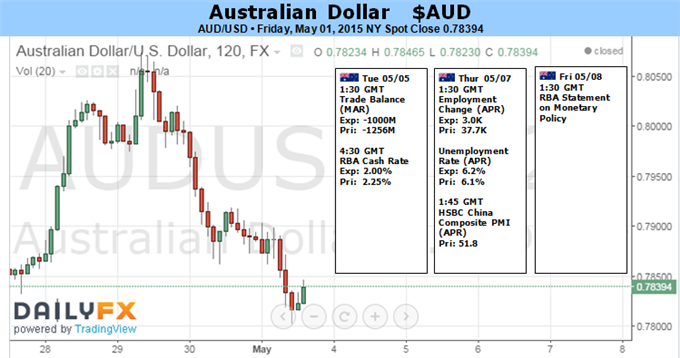 AUDUSD Outlook Mired by Speculation for Reserve Bank of Australia (RBA) Rate Cut. EUR/USD outperforms against its major counterparts, but lack of momentum to break/close above the 1.1300 handle (78.6% retracement) raises the risk for former support to turn into new resistance; need a break of the bullish RSI momentum for conviction/confirmation a near-term top is in place. With the narrowing risk for a Greek default/exit, positive data prints paired with the upbeat tone from the European Central Bank (ECB) may spark a ‘taper tantrum’ in the euro-area over the near to medium-term. 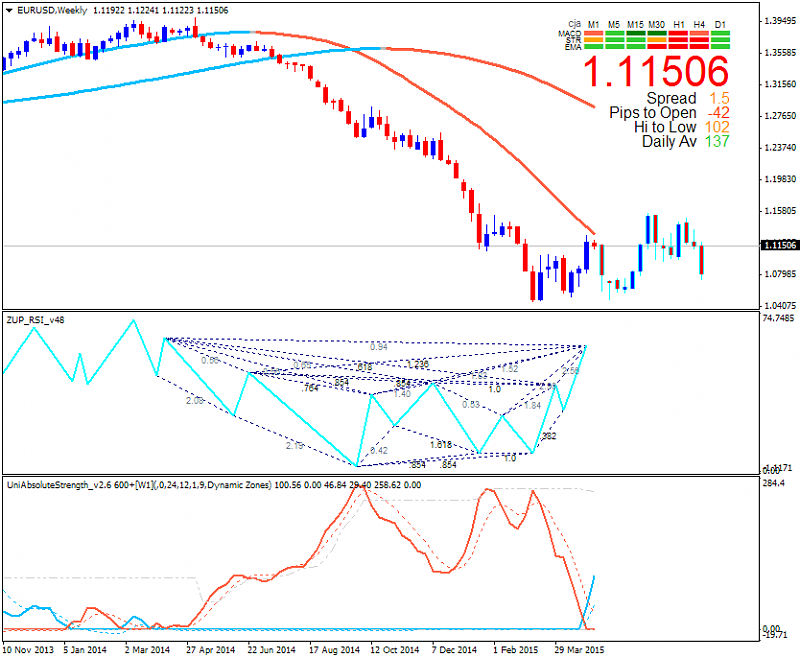 The EUR/USD closed the week at 1.1199 after touching a two month high. The dollar extended its gains against the pound from Thursday’s session after weaker-than-expected manufacturing report. It has recovered most of its losses from earlier in the week. Economic data released Thursday showed Chicago-area manufacturing activity expanding for the first time in three months, weekly jobless claims falling to their lowest level in 15 years, and a larger-than-expected increase in a closely watched measure of wage inflation. That data helped support the argument, advanced by Federal Reserve policy makers, that weak first-quarter growth was primarily due to transient factors, including bad weather and labor disputes at western seaports. While not spectacular, Friday’s data didn’t provide a strong signal to the contrary. Strong economic data increases the possibility that Fed policy makers will raise interest rates at their June meeting, a move that would benefit the dollar. The euro posted its biggest monthly gain in 4 1/2 years in April as speculators pared record bearish bets. Positive economic reports suggest the European Central Bank’s asset-purchase program is working, while U.S. growth remains uneven. Markets in Europe, including Germany and France, were closed for national holidays, leading to thin trading. The euro is still forecast to fall by year-end. The median estimate of more than 60 economists compiled by Bloomberg News sees the euro at $1.04 on Dec. 31, more than 7 percent lower than yesterday’s closing price. Last edited by TheNews; 05-03-2015 at 08:50 AM. The euro backed off two-month highs against the dollar on Friday after reports indicated that the U.S. economy may be stabilizing after a recent soft patch. EUR/USD was down 0.22% to 1.1198 late Friday, still not far from two-month peaks of 1.1289. The Institute for Supply Management reported that activity in the manufacturing sector was stable in April, after slowing in the five previous months. The ISM manufacturing index came in at 51.5 in April, matching the March reading, which had been the lowest since May 2013. Another report showed that U.S. consumer sentiment rose in April to its highest level since January. Separately, the Commerce Department said construction spending fell 0.6% to an annual rate of $966.6 billion in March, the lowest level since September. The reports, while mixed, fuelled optimism that the U.S. economy has turned a corner after a recent bout of weakness. The dollar had received a boost after a report on Thursday showed that the number of Americans filing new claims for jobless benefits fell to a 15-year low of 262,000, pointing to healthy growth in the labor market. The U.S. dollar index, which measures the greenback’s strength against a trade-weighted basket of six major currencies, was last up 0.53% to 95.38 late Friday, after falling to two-month lows of 94.47 on Thursday. Data earlier in the week showed that the U.S. economy grew just 0.2% in the three months to March, slowing from 2.2% in the final quarter of 2014. It was the slowest rate of growth in a year. The weaker-than-expected data prompted investors to push back expectations on the timing of an initial rate hike by the Federal Reserve to later this year from midyear. Demand for the euro continued to be underpinned after data on inflation and bank lending earlier in the week added to signs that the recovery in the region is gaining traction. Sentiment on the single currency was also boosted by hopes that Greece is moving closer to an agreement with its international lenders on a package of economic reforms needed to unlock bailout funds. In the week ahead, investors will be focusing on Friday’s U.S. nonfarm payrolls report, for a fresh indication on the strength of the economic recovery. Service sector reports from the euro zone will also be closely watched. The euro area is to produce revised data on manufacturing activity. Later in the day, the U.S. is to publish figures on factory orders. In the euro zone, Spain is to publish its monthly employment report. The U.S. is to release trade data, while the Institute of Supply Management is to release a report on service sector activity. The euro zone is to publish revised data on service sector activity and a report on retail sales. The U.S. is to release its monthly ADP nonfarm payrolls report and later in the day Fed Chair Janet Yellen is to speak at an event in Washington DC. In the euro zone, Germany is to publish a report on factory orders. 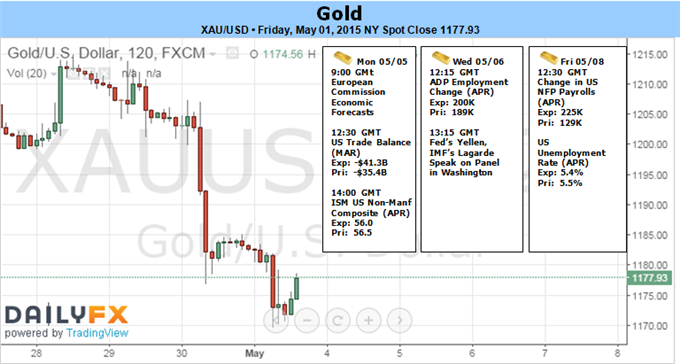 The U.S. is to round up the week with what will be the closely watched government nonfarm payrolls report. EUR/USD has broken higher from its triangle as the pair has gone past 1.10-1.1050 resistance, which held the top of the March/April triangle formation, notes Goldman Sachs. "It is now clear that the analogy of a triangle wave 4 is no longer valid. The possibility that it’s already completed 5- waves from the May high is something to seriously consider. If this is true, it should already have started a corrective process which translates to a period of messy/counter-trend price action," GS argues. The first big signal suggestive of a turn, according to GS, was given on Tuesday’s close above the 55-dma which has held the entire downtrend since the May 8 th high. "The final break above it should have been a big warning sign that the low may already be in place. Further confirmation was given above 1.1052-1.1099 (prior high and low from Jan. 26th/Mar. 26th)," GS adds. "The next big pivot is 1.1295-1.1296; this includes 23.6% retrace of the May/March decline and the 100-dma. So far it seems to be holding well, forming a tired candle on stretched momentum. Support is down at 1.1099-1.1049," GS projects. "If this is truly a correction, there should be potential to go higher over time. The downtrend from Jul. ‘14 comes in at 1.1654.and 38.2% of the May/March decline is all the way up at 1.18," GS adds. "Put simply, from a pure techs perspective and in Elliott wave terms, this has potential to be a very big turning point," GS concludes. 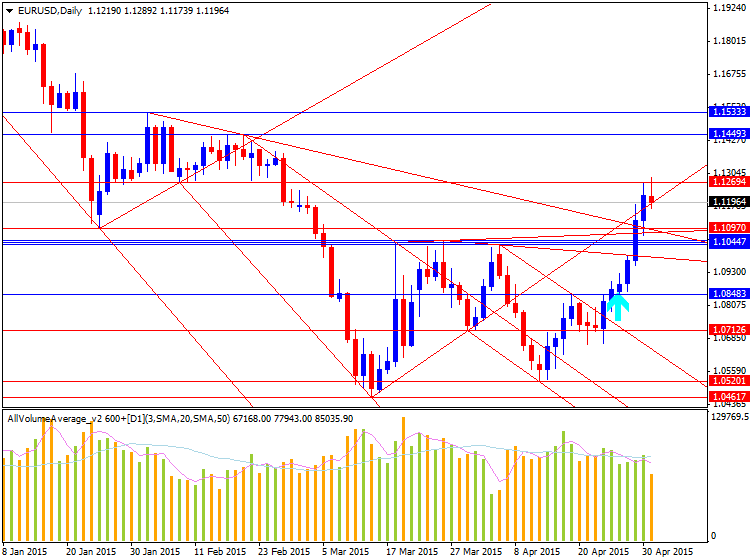 The EURUSD opened Tuesday's London trading session attempting to breakout towards new weekly lows. However, despite declining as much 85 pips from today’s open, EURUSD price action is now trading back inside of its Camarilla pivot range. 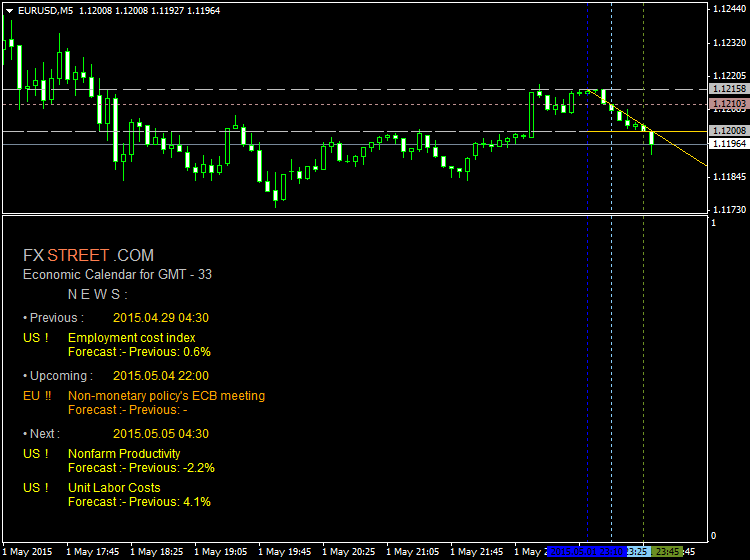 Currently, price is trading under range resistance which is found at the R3 pivot point at 1.1173. In the absences of a breakout to a new higher high, traders will begin watching for price to move back through today's 57 pip trading range back towards range support at 1.1116. It should be noted that price has already failed once to break below the S4 pivot at 1.1088. 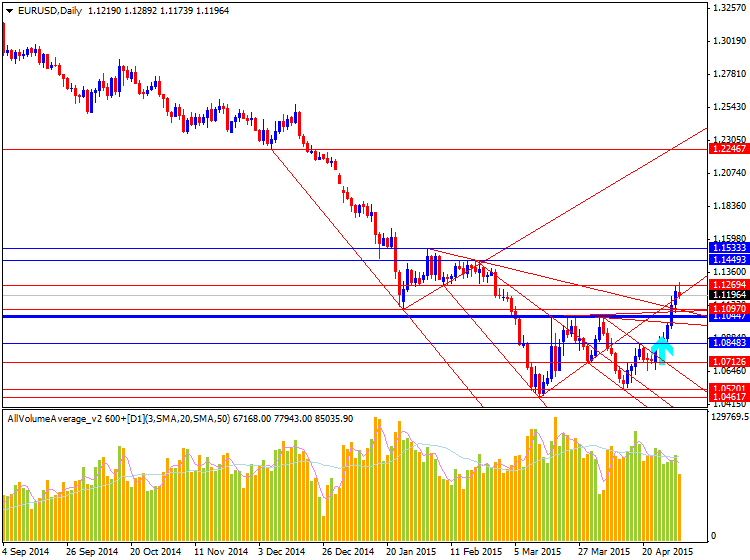 Despite price quickly rebounding from support, a retest of this value could lead to further bearish momentum for the EURUSD. Alternatively a breakout above the R4 pivot at 1.1201 would suggest price returning back in the direction of its current daily trend. In either breakout scenario, traders can use a move through either the R4 or S4 pivot point to signal the end of current range bound conditions.